Hillary “What difference does it make” Clinton is scheduled to speak tonight night at a Democratic National Committee Fundraiser event at Brentwood’s Tavern restaurant in Los Angeles. The fundraiser event — the third major Demonrat fundraising in L.A. in a month — is sponsored by Hollywood heavyweights and diehard Demonrats director Steven Spielberg, Dreamworks Animation CEO Jeffrey Katzenberg, and Disney Studio chairman Alan Horn. Tickets for the event for monied Hollyweirdos, which include a reception, photo and dinner, cost $32,400 each — the maximum allowed individual contribution to a national party committee per calendar yer. 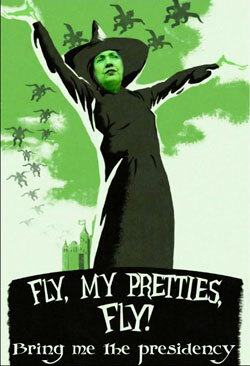 Below is the image that would have greeted the Hildebeast — that of an evil flying monkey from The Wizard of Oz. According to Tina Daunt of The Hollywood Reporter, Oct. 17, 2014, the “flying monkey” sign is the creation of guerrilla street artist SABO. But SABO recounted that almost immediately, one poster near a Whole Foods grocery store was “violently” torn down. Louisiana native SABO, the conservatives’ answer to liberal artists like Shepard Fairey, had moved to Los Angeles in 1987 to attend the prestigious Art Center College of Design in Pasadena. A caricature of former House Speaker Nancy Pelosi twerking, which helped launch the conservative website Breitbart California, triggered demands for an apology from a cross section of angry Demonrats. In addition to the flying monkey posters, SABO has been busy working on a fake Tavern website, which ridicules Hillary and the Democratic Party. In a recent interview with The Hollywood Reporter, SABO said Hollywood and politics have become a focal point of his guerrilla art, particularly with his “Drone” campaign, which also features Samuel L. Jackson, Alec Baldwin and Jon Stewart. Alas, a mere day after SABO had put up the Hillary flying monkey signs, all of the posters and banners were either removed or painted over. Because in America today, and especially in Demonrat-worshipping Hollywood, you just can’t have those satiric but entirely accurate flying monkey signs offend Queen Hillary, free speech be damned. Who’s without a soul? Hillary or Putin? This entry was posted in 2014 Election, 2016 Election, Art, Conservatives, Culture War, Evil, Hillary Clinton, Hollywood liberals, Liberals/Democrats/Left and tagged Abortion Barbie, Alan Horn, Democratic Hollywood fundraiser, Gwyneth Paltrow Obama drone, HIllary Clinton flying monkey, Jeffrey Katzenberg, Nancy Pelosi twerking, SABO, Steven Spielberg, Tavern restaurant, Wendy Davis. Bookmark the permalink. A lush should be no where’s near a tavern. Are supporters just going to “drink away” the knowledge of Hillary Clinton’s derelictions of duty, as Secretary of State? Are U.S. Citizens to just forget that she ignored the pleas of the Four Men in Benghazi, one of which was her friend, and our U.S. Ambassador to Libya, Christopher Stevens? I find Fund Raisers are just full of pork and beans! And, flatulence is soon to follow in the wake of her audacious bs! I LOVE this guy, it takes guts to do his artwork in the middle of Liberal Loon Land. Isn’t it amazing how very thin skinned these Liberals are when its given back to them? Sniveling babies. Love this story! They (Dems) can dish out but they sure can’t take it! I think this clever art is the perfect way to get some of those people to think. The Republicans should hire this guy – they need fresh ideas to appeal to young voters. Couldn’t we just send ALL the Democratic Candidates and supporters to help treat Ebola patients? BTW-we ALSO need to mandate (Why isn’t the UN doing this part-it’s their JOB!) NO travel FROM infected Countries without 2 month quarantine followed by a full physical and tests/bloodwork,signed off by a Dr. TRAINED in Ebola treatment. NO private flights from those Countries without fully verified Flight Plan with the Health documents and sign off.